ARYA College of Engg. & IT (ACEIT) is known for the quality education and stringent levels of discipline. Since inception, ACEIT has shown consistent performance in academics and extra-curricular spheres. The management strives constantly to develop this institution into a “CENTRE OF EXCELLENCE” imparting Engineering & Management Education to budding talent, grooming their overall personality with the highest emphasis on ethical values and honing them to face the challenges of the industry and the corporate world at images/gallery. 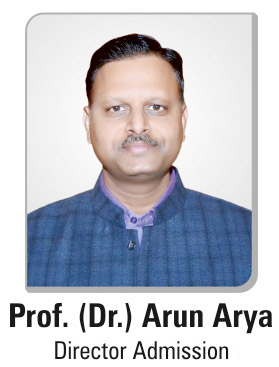 Ideally nestled in the lap of Aravali, the infrastructure of ARYA College of Engg. & IT (ACEIT) is designed to challenge & stimulate the finest minds. This temple of learning is most appropriately situated on the NH-8 ‘the Educational corridor of Rajasthan’, in Kukas, Jaipur. The spacious & imposing setup of the campus with its architectural beauty provides the most invigorating environment to optimize the functional efficiency of the students. Arya College is known as the Most Technically Advanced College of North India. The college support and promote the modern technologies coming up with the time. The college gives you the 25 Acres of Serene WI-FI e-Campus. The college buildings are well- designed and attract the students. The college constitutes of a wide state of art laboratories. All the labs at the college campus are well equipped with modern technical equipment. The college consists of 2500 Computers approximately. All the computers are running on LAN and WAN services with a positive state of art facilities. There are 80 well-equipped labs for other departments including CNC & UTM. The college has a well- furnished library in the college campus. The library consists of a wide range of books. It has a large space area for the student to sit and study. The college provides the facility of 24 hours assistance. There are three AC Auditorium. Each auditorium has the seating capacity of almost 800 students. The auditoriums are equipped with the modern and latest audio-visual aids for the conferences, seminars, and events at the college. The college is also providing the transportation facility to its students and staff. There are almost 25 college buses, which passes through almost every route enrooting towards the college. The Cafeteria at the college has a wide range of variety food. There is a mess in the hostel for the hostellers of the college. The college takes care of the hygiene and cleanliness of the food. The college has seven boys & five girls fully furnished hostels with the attached bath facility. The college has security guards for the 24 hours safety of the students at the college premises. The college provides 100% study loan assistance at the premises for the students. The college believes in “Right to Education” for every student. Arya College is a Plethora of extracurricular activities, Workshops, and PD Sessions. The college conducts many technical fests to encourage and develop the skills of the students. Regular Aptitude Tests, Mock Interviews, Seminars & Workshops etc. is a part of college activities. This preparation helps in the development of the student academically as well as personally. Now, you can also follow Arya College on its Facebook, Instagram, LinkedIn, Twitter, and Google+ Share profile.